Monteriggioni is a super tiny burg located 30 minutes away from Siena and a little over an hour from Florence. The pronounce is [mohn-teh-reed-JHO-nee]. The village is so lovely that several films have been shot here. Among them, Stealing Beauty, The English patient and The gladiator. Three movies I like a lot by the way. Moreover, it was included in the Assassin’s Creed videogame saga. This place is very dear to me cause I discover it by chance some years ago. 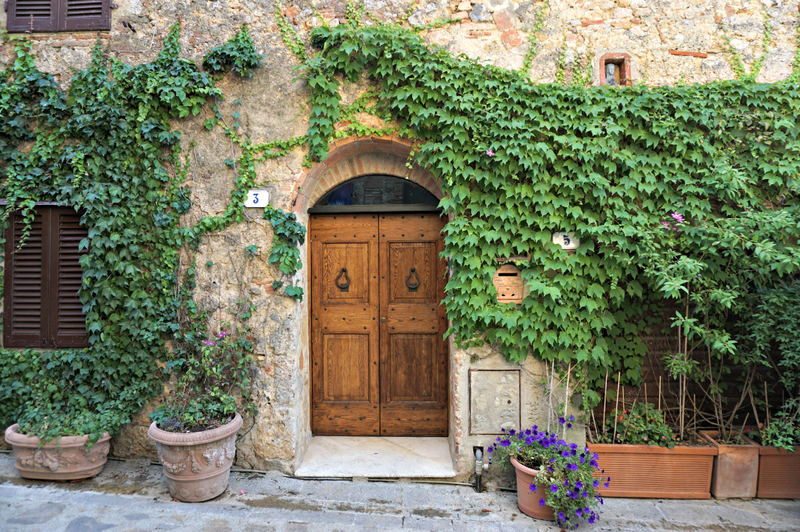 I knew nothing about it and to me it was a huge emotion to arrive and spot from a distance its circle of walls, and then to explore the beautiful alleys and to have dinner in a romantic restaurant just next to the quaint piazza. If you’re impatient, you can go directly to the video at the end of the post! It was like a travel back in time and so I hope it’s going to be the same for you, if you’ll decide to visit this unique place. Its name derives from the Latin words montis and regis, meaning mount of the king. Monteriggioni castle was build by Sienese people in the early 1200s. The purpose was obviously to defend their territory and to control the movements of the rival Firenze. It seems that there was once a moat all around the walls. But it was not filled with water. On the contrary, it was filled with coal and wood, ready to be burnt in case of siege. Dante quotes Monteriggioni in his Inferno (dating back to the beginning of 1300). He was very impressed by the height of the towers (once higher than now), that he compared them to the Hell’s giants. Here in Monteriggioni, Dante received the sad news of his banishment from Florence. 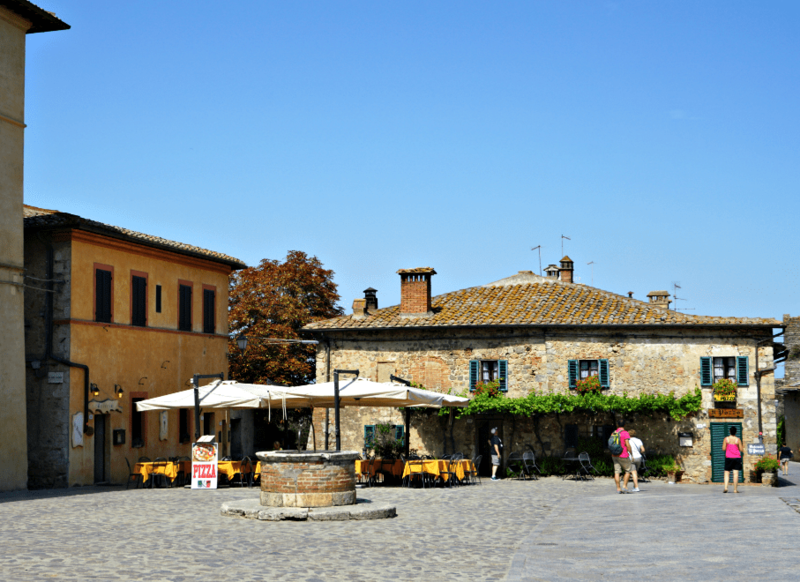 For centuries, Monteriggioni has resisted many attempts of conquer. In vain. Until it was ceded to Florence without fighting, as a result of a treason. Someone says that the laments of the traitor’s ghost are well audible on cold full moon nights. This episode marked also Siena’s fall. After the war, it became a Medici’s possession, and later on it was given to the Griccioli family, who still owns part of the castle and of the surrounding countriside. The walls have been restored in 1920’s and 30′. That’s when the towers, sadly torn down in the past centuries, were reconstructed. They are 570 meters long and 2 meters thick. The visible towers are 11, while once they were 15. Their height is now about 6 meters, but in the Middle Ages they reached 15 meters. The doors are two: Porta Romea towards Siena and Porta di San Giovanni towards Florence. Since 2005 you can climb the walls and admire the panorama in two points. Nowadays there has been a rediscovery of this burg, as it is included in the via Francigena path, a medieval walking route for pilgrims, connecting Canterbury to Rome. The main piazza is Piazza Roma. Here you can see the sober church (1219) of Santa Maria Assunta. La Vecchia Ghiaccera, a lovely shop in a likewise lovely building. It sells handmade purses and home décor objects. I fell in love with this shop. Spezieria Toscana, a yummy shop for gluttons. Honey, jam, cookies and bon-bons made in Tuscany. Their motto: Who’s looking for happiness will find Spezieria Toscana. 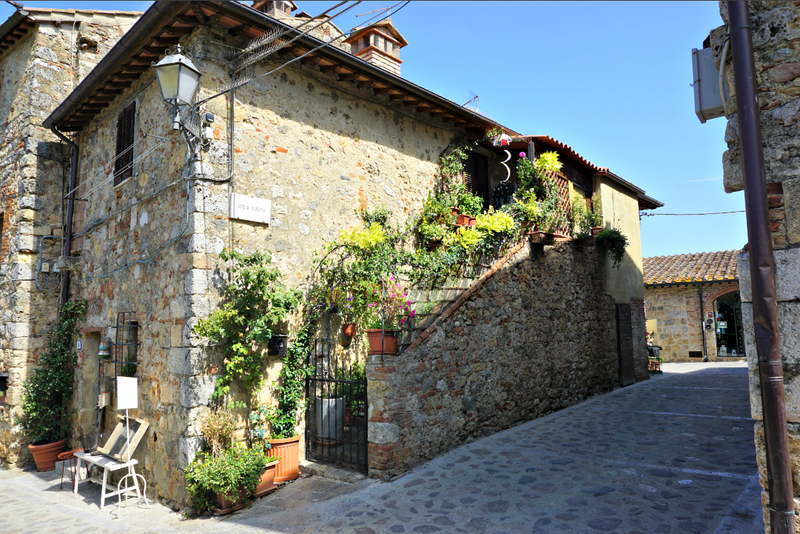 If you are looking for a traditional spot inside the walls, I sugegst you to go to Il Pozzo. Its facade is very popular because it was used for a poster you can buy online and representing the essence of Tuscany (see the first photo on top of this article). The meal was delicious and traditional. But I do not recommend the desserts. Quite ordinary and too pricey. Pity! Better to end the meal with a good caffé. Here Matteo and I enjoyed a romantic dinner. 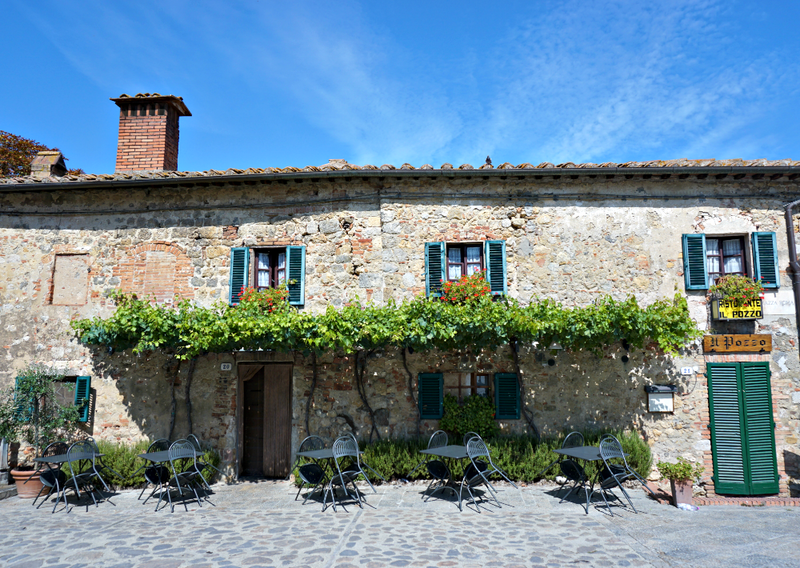 If you want something less expensice you can try il bar dell’Orso, 1,5km away from the village. It’s a very informal place, where locals and tourists come at every hour of the day for a meal or a quick panino. Very tasty and a good value for money. I tried it on Easter weekend, when Matteo and I were with two of our best friends. Arriving by car, as we did, there’s a convenient parking lot just outside the South door. Of course it’s not free. As I wrote at the beginningof the post, the village is 30 minutes North West of Siena and 1 hour and 20 minutes South of Florence. Sadly, there’s no public bus leading there, so you have to drive a car. In July you can attend to the Medieval Feast with artisans, musicians, banquets etc. More info at on their Facebook page. Mamma mia, I’d love to attend!